Compact 2-component, servo driven Progressive Cavity metering unit suitable for processing the smallest metering volume in precision applications requiring the necessity of processing abrasive or shear-sensitive materials at the highest accuracy. For Low- to medium viscous materials with functional fillers. 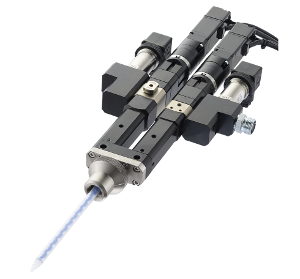 Compact and lightweight, ideal for robot mounting for high accuracy of the smallest volumes.